Plan on coming to the I-X Indoor Amusement Park as a group? Take advantage of our great group perks! Order your tickets in advance and save $6 on your general admission tickets. For more information on our group rates and to reserve your tickets, contact Scott McGorty. After 5:00 pm, everyone under the age of 18 is required to be accompanied by a parent or parental chaperone to enter the Amusement Park. Proof of ID required. Amusement rides* – no tickets or wristbands needed! Live Performances & Animal Shows – see event calendar for dates/times and performers! Petting Zoo** – full of cute critters ready to say hi! 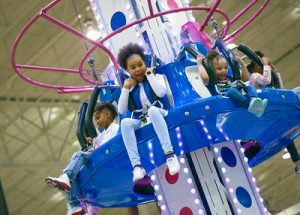 Kidzville – lots of pint-sized rides! Mountain Dew Thrill City – For the adrenaline fan! Great vendors to shop from! *Each ride has height and size restrictions. Not all patrons can ride all rides. **Does not include feed for animals.